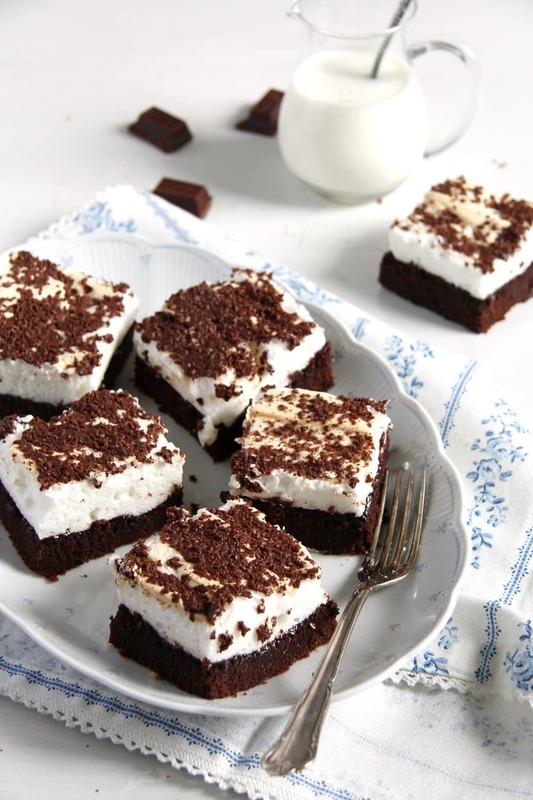 Romanian Meringue Brownies – Negrese: a decadent cocoa brownie with a sweet and fluffy meringue topping. This is the typical Romanian interpretation of a brownie. I knew this all my life, long before I even knew that brownies are such a popular dessert all over the world. 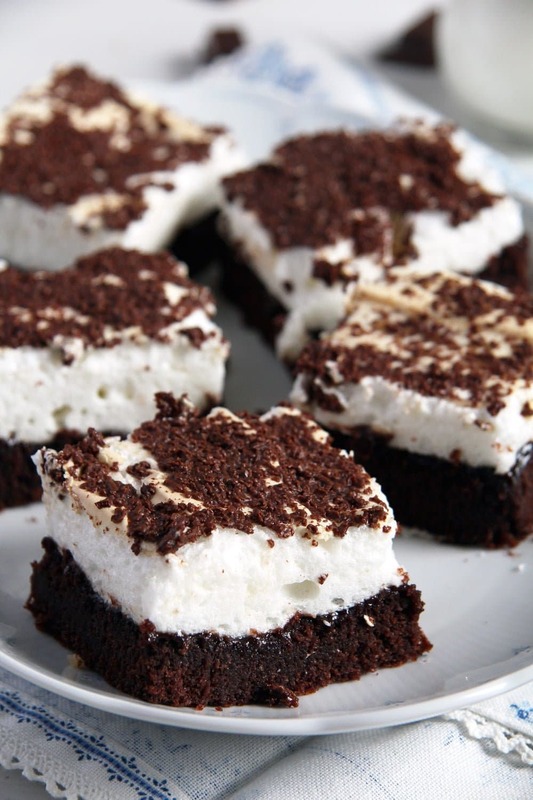 There was a time in my teenage years when my mother would baked these Meringue Brownies quite often and I even remember myself eating some from time to time, which was quite something considering how I used to despise most cakes. It was also, like in the case of the Romanian Biscuit Salami, one of the first cakes I’ve baked myself. Well, not alone, there were several of us, all girls in the kitchen of my mother’s neighbor. I remember mixing the batter, pouring it in the tin and putting it in the oven. 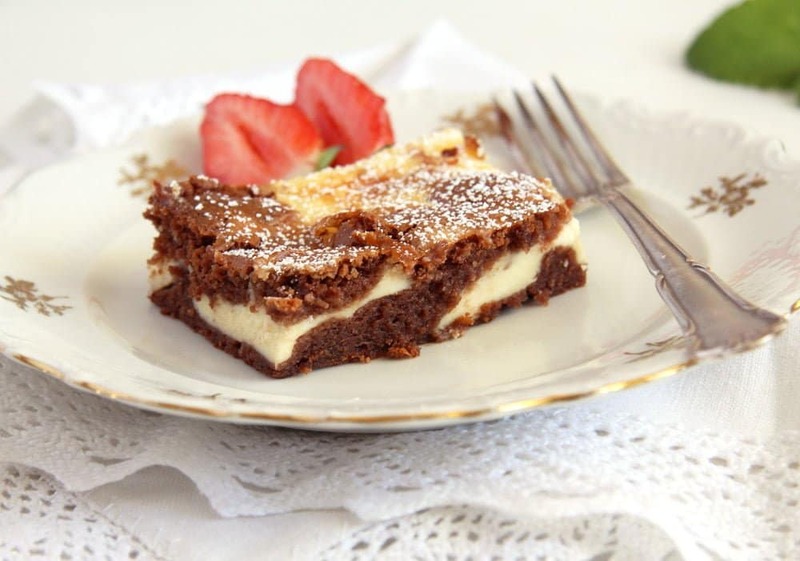 A few minutes later we noticed that we had forgotten to add the baking powder to the batter, so we took the cake out again, mixed the baking powder directly into the pan and continued baking the meringue brownies. 🙂 🙂 You can imagine the result! The cake tasted good (I think) but it was 1 cm high in some places and 5 cm high in other places. 🙂 🙂 But still we ate all of it and I remember that I preferred the flat, quite wet parts of the brownies. 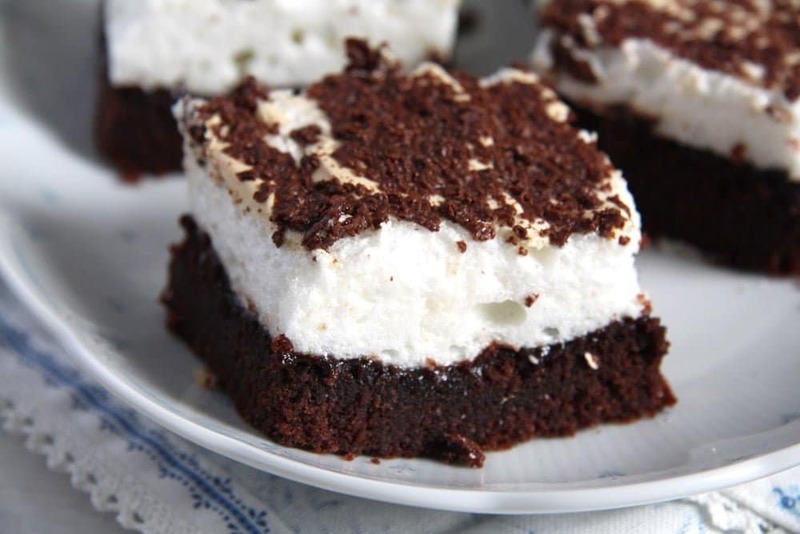 Although I bake many different kind of brownies nowadays (have a look at some of my favorite, for instance these Zucchini Cashew Brownies or these Vegan Brownies with Coconut Cream), the Romanian Meringue Brownies remain my favorites. 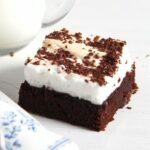 The brownie part is amazing, dense and slightly moist, sweet and chocolatey, just like a brownie is supposed to be, but what I like most is this light meringue topping which really adds a new dimension to an otherwise quite regular brownie. Give it a try, you won’t be disappointed! This is not my mother’s original recipe, I don’t have that anymore, but I think this recipe is very similar to the one I used to know. At least it looks exactly the same and it tastes like it supposed to, which is absolutely delicious. I found the recipe on a Romanian blog called LaLena and decided to make it because it looked just the way I remembered my mother’s brownies and, very untypical for me, I didn’t feel the need of changing anything, this was a perfect Romanian Meringue Brownies recipe. Preheat the oven to 180 degrees Celsius/ 360 degrees Fahrenheit. Line a baking tin (approximately 23x33 cm/ 9x13 inches) with baking paper. Separate the eggs. Set the egg whites aside for the meringue. Beat the egg yolks, sugar and pinch of salt together until light and fluffy. Add the very soft butter and mix well. Add the milk and mix as well. Mix together the flour, cocoa powder and baking powder and incorporate into the egg mixture. Add the rum aroma, if using. I left that out because I don't remember tasting the rum in my mother's recipe. Pour the batter into the prepared tin and bake for about 15-20 minutes. Check after 15 minutes, the batter should have formed a crust and should not be very jiggly in the middle when pushed with the finger. If it is still too jiggly bake for another few minutes. In the meantime prepare the meringue. 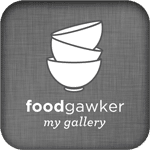 Beat the egg whites and the salt on high speed until quite stiff. Slowly add the sugar and the vanilla extract and continue beating until the mixture is stiff and glossy. Reduce the oven temperature to 160 degrees Celsius/ 320 degrees Fahrenheit. Spread the meringue on top of the brownie and continue baking for about 10 minutes until the meringue has risen and is slightly golden. 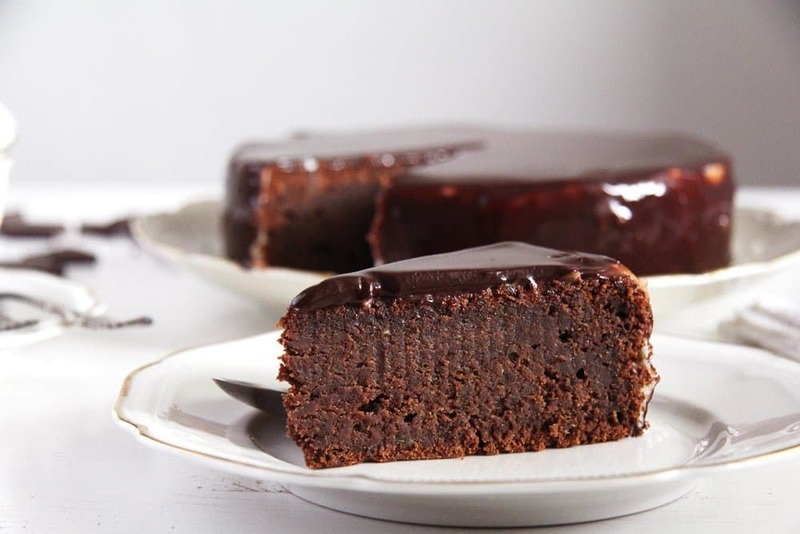 Grate the chocolate and sprinkle on top of the cake as soon as you take it out of the oven. It’s incredible! A cocoa-based cake is also one of the first cakes I’ve ever baked as a teenager or a child maybe…. I don’t remember if it was a success or not but even now I sometimes forget a crucial ingredient in a cake…. Too distracted! 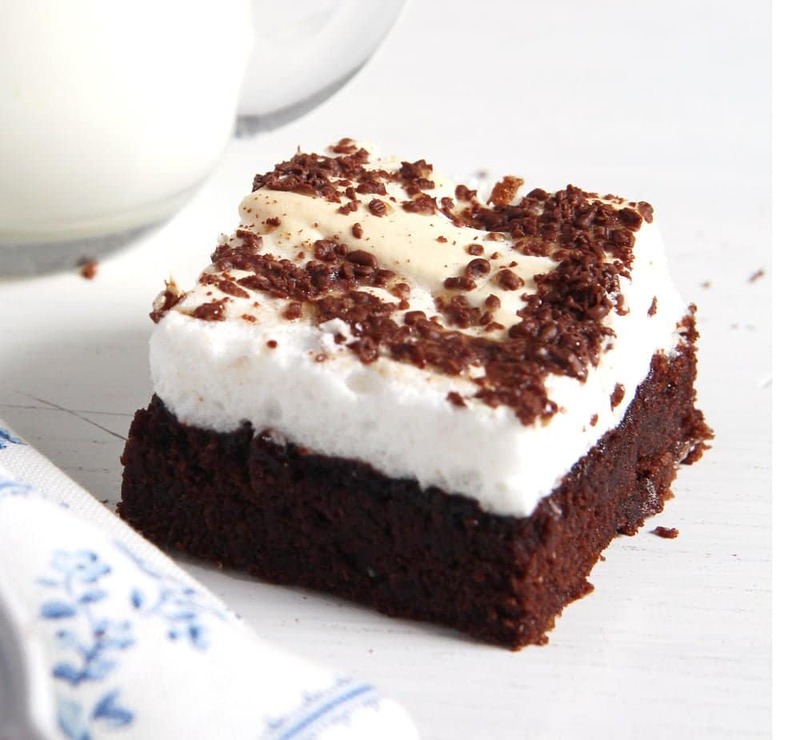 Oh yum, love that light meringue, what a wonderful contrast to the rich brownies! Un deliciu, arata tare bine! Chiar am pofta de ceva bun, negresele astea sunt desertul ideal! I love a good brownie. And the meringue topping makes it even more tempting! I’ve never had a meringue topped brownie. Sounds and looks so good! I’m thinking that meringue is better than frosting! These look amazing! I mean who can resist brownie with a bonus meringue! mmmmm! Does black chocolate means dark chocolate? Yes, I just translated that word for word from Romanian or German, in both cases black chocolate. 🙂 I will change it.